We help teachers and students learn how to create cross-platform, 3D web sites with coding and design basics. WebXR is here. Frame Academy is also a community with places to ask questions, share projects, and showcase events. We offer free online projects and lessons that take students from scratch to creating brilliant 3D websites. We deliver online or in-person WebVR workshops for your staff or students. Interdisciplinary + fun. This is a place where you can explore creations and resources from the Frame Academy community. Frame Academy is also a community with places to share ideas, projects, and resources. We offer free online projects and lessons that take you from scratch to creating brilliant 3D websites. We deliver online or in-person WebVR workshops for your staff or students. Interdisciplinary and fun. 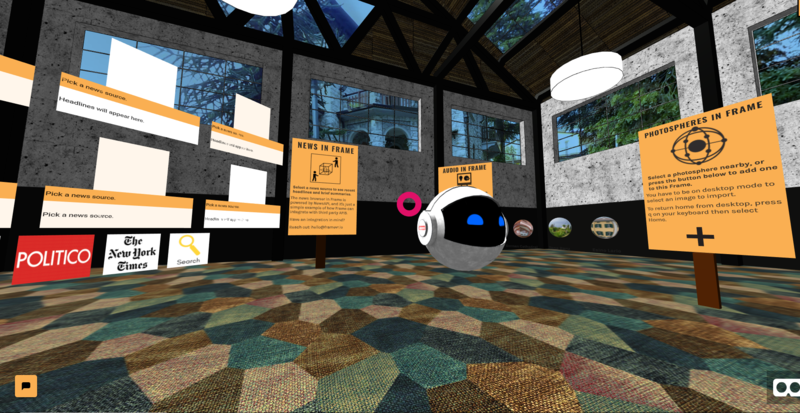 These free projects are hands-on activities that will help you or your students learn how to create interactive 3D sites with WebVR. There are both technical and artistic skills involved: coding, 3D design, and more. There's a lot more coming soon. Each project focuses on different skills so you can tackle them one by one. The projects also build on each other. Once you do Project #1, you'll be ready to tackle Project #2. This project doesn't require any knowledge of coding, but you will learn a bit of HTML as you go through it. Throughout the project, you'll build a WebVR site that works on desktop, mobile, and VR headsets. In this project, you build on the HTML skills you learn in Project 1 to add cool animations to your WebXR site. You'll also learn about components, a super easy way to bring sweet features into your projects. In this project, you continue building on HTML skills while you learn about relative position, grouping entities, and the A-Frame asset management system. It's the final step before we move on to adding interactivity! In this project, you'll bring audio and video (including 360 video!) into your WebXR projects, giving you more tools in your toolkit and adding more ambiance and immersion to your A-Frame sites. You'll build a music player, a videosphere gallery, and more. want to see some frame academy projects? See the rest of the Frame Gallery here. A new dimension has arrived to the web. Learn all about it. With WebXR, people can now build 3D experiences that run directly from a web browser on desktop, mobile, or VR/AR headsets. Our online or in-person workshops show teachers and students how to get started with WebXR with a tool called A-Frame. WebXR provides an incredibly fun, tangible, and engaging way to dive into the basics of coding, 3D design, and more. Sure, these STEM/STEAM skills are nice for possible career-readiness. More importantly, though, we think they: spark imagination, invention, creativity, and a continuous, interdisciplinary learning journey. We can work with your staff or directly with your students, online or in person.